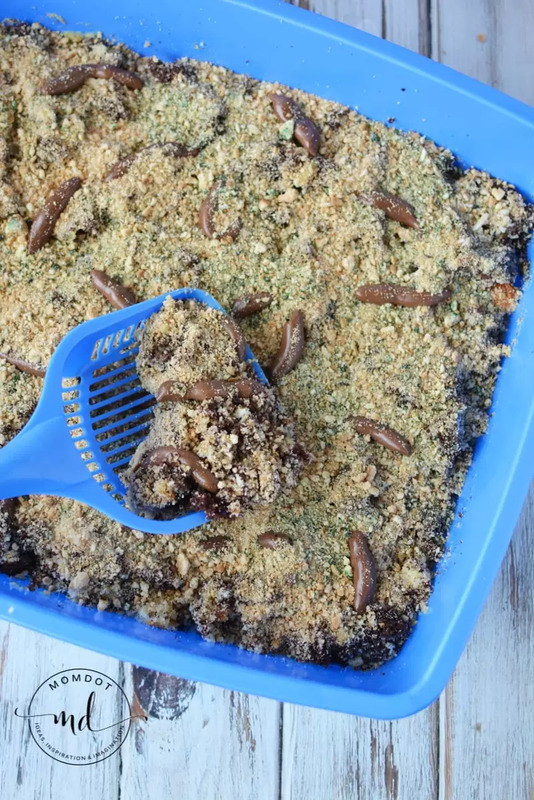 Kitty Litter Cake is one of the grossest and tastiest recipes to make Halloween a scream this year! 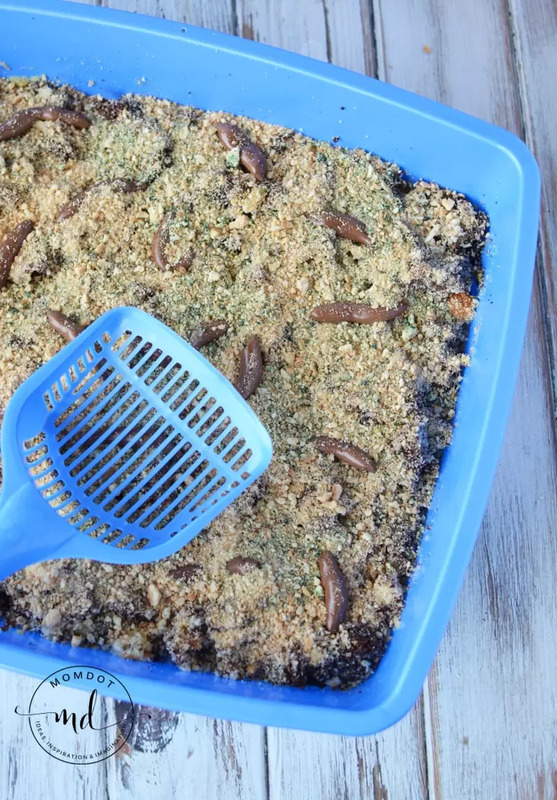 Serve up this kitty litter cake recipe (made with box cake mix and tootsie rolls) and see which one of your friends will take the first bite. Printable recipe version and pictures below! I am the proud owner of 6 cats so to say we have had our share of litter boxes around here is a serious understatement. It’s a chore no one in the family wants and we all pass on to the next person. Now when it comes to learning how to make Kitty Litter Cake, that’s one thing every one in my family wants to be a part of. 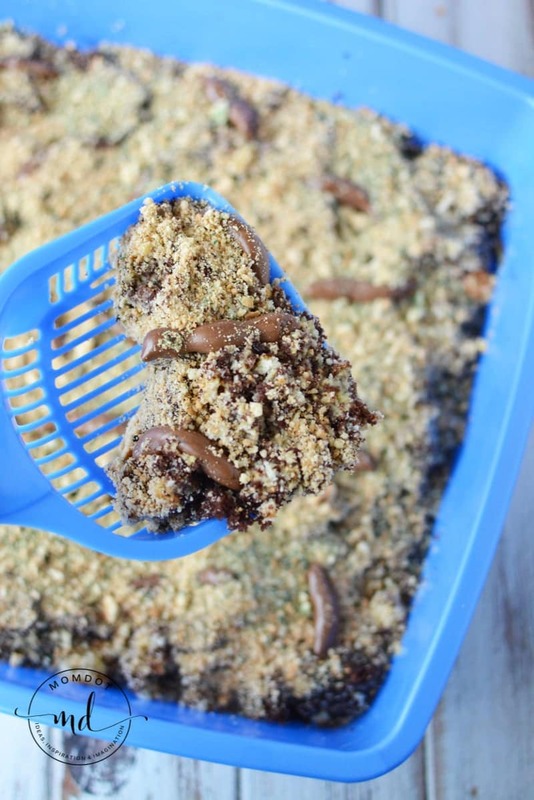 This perfectly disgusting yet total tasty kitty litter cake recipe will freak out even the most stable stomach and make for a frightfully funny Halloween dessert. 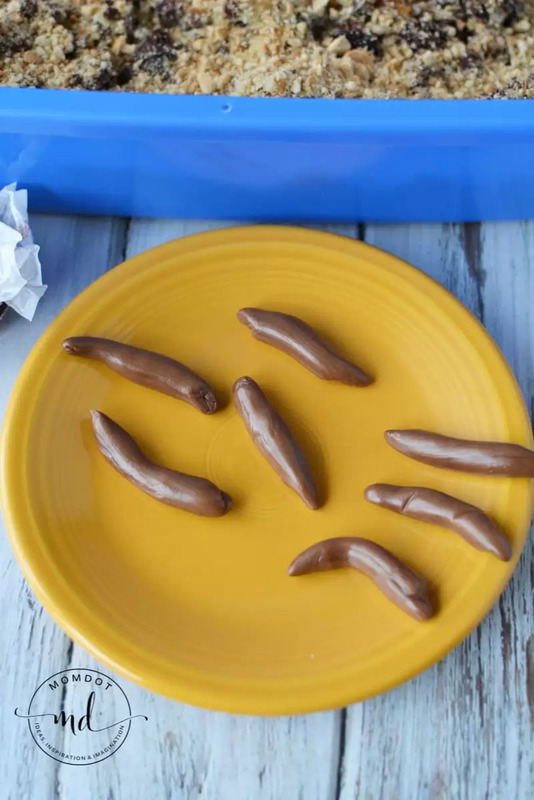 Do you have what it takes to take a scoop of broken down cake kitty litter and tiny soft chocolate tootsie rolls resembling poop? 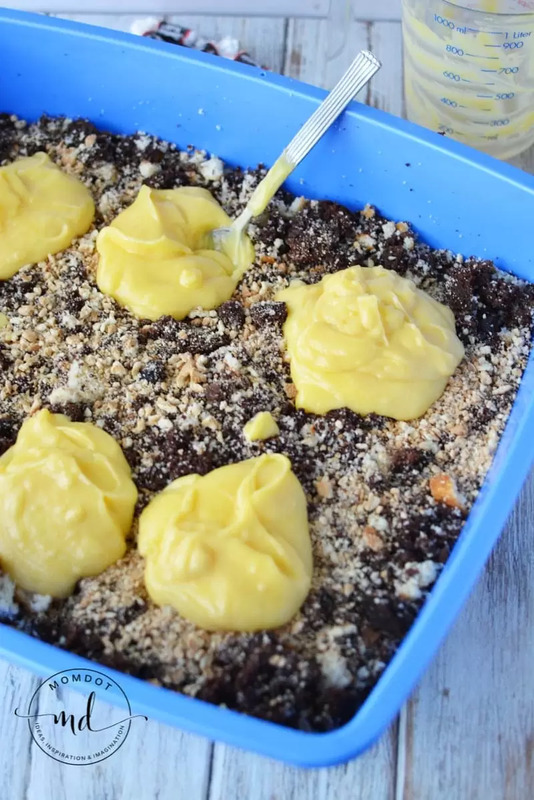 This kitty litter cake is also super fun for an office party or to gross out your kids if you do not tell them it’s coming. Of course it also makes a fun cake to make WITH your kids so your choice. I note below, but just to make sure I am clear, you will need a BRAND NEW and CLEAN kitty litter box and poop scooper…no cleaning out kitties box for this one! Let’s get started on this gross cake! 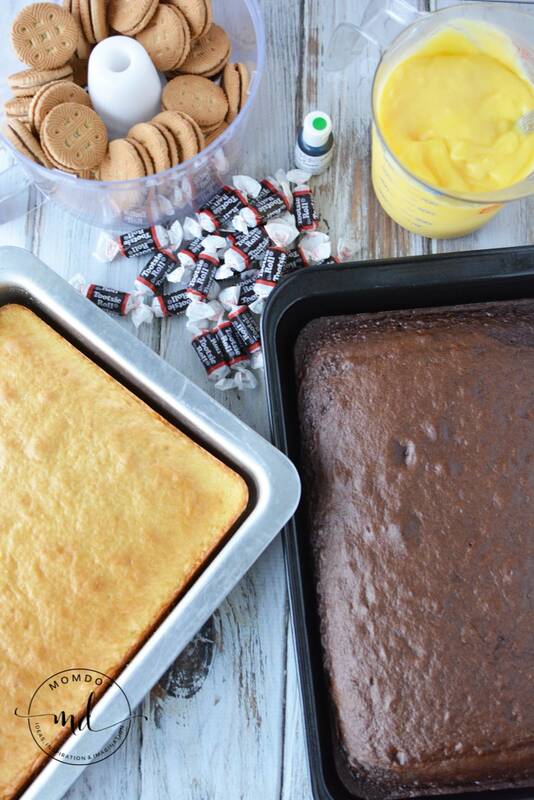 Bake chocolate and vanilla cake according to package directions and let cool completely. In place of the boxed chocolate cake, you can also use brownies for your kitty little dirt. Mix milk and instant pudding and prepare according to package directions. Refrigerate. Add cookies to a food processor and process for about 10 seconds or until crumbs form. Remove 1/4 cup of cookies and mix with drops of green food coloring, set aside. 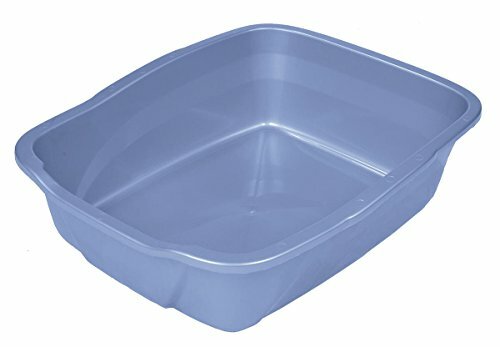 Cut each cake and place cake into litter pan. Crumble with your fingers to break apart, which is the basis for your “litter”. Add pudding and half of the cookie crumbs. Mix well with a spoon to combine all ingredients. Open, unwrap but leave the wrappers under the candy, 7 tootsie rolls, and place the tootsie rolls in a microwave safe plate. Microwave for 10 seconds and remove from oven. Shape and roll tootsie rolls into cat poop shape. 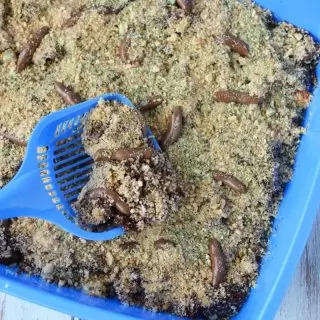 Place on kitty litter cake. Repeat until you have all tootsie rolls shaped and placed into pan. Sprinkle with remaining crushed cookies, adding green cookies on the top of the crumbs. 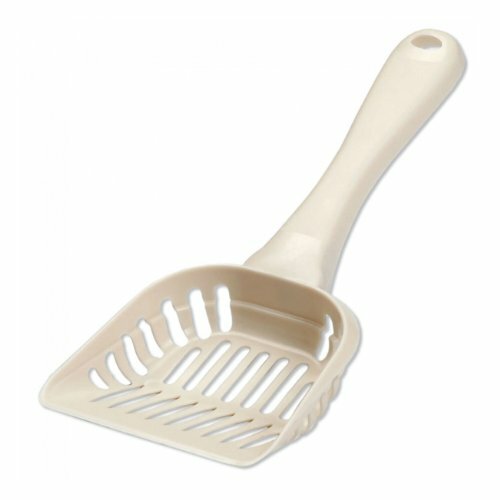 Serve with a kitty litter scoop. 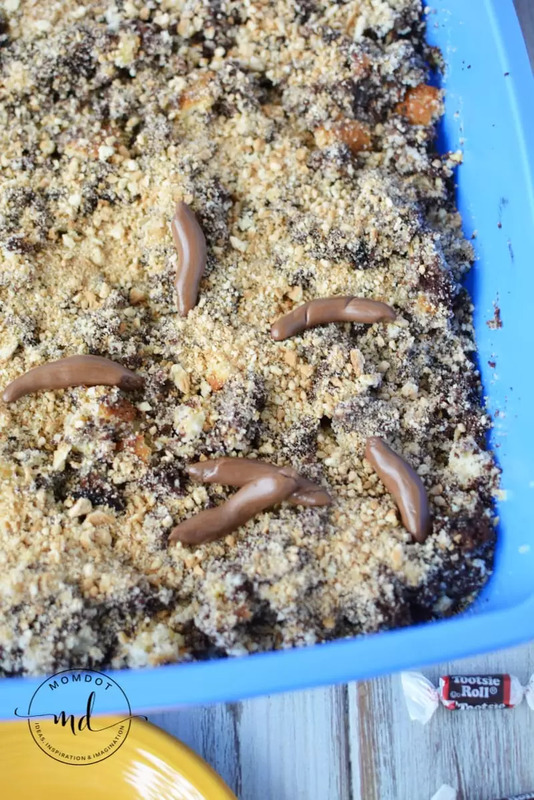 Kitty Litter Cake is a delightfully disgusting Halloween Dessert. Made with boxed cake, trick your guests into thinking its real! Bake chocolate and vanilla cake according to package directions and let cool completely. Add cookies to a food processor and process for about 10 seconds or until crumbs form. Remove 1/4 cup of cookies and mix with green food coloring, set aside. Cut each cake and place cake into litter pan. Crumble with your fingers to break apart. Add pudding and half of the cookie crumbs. Mix well with a spoon to combine all ingredients. 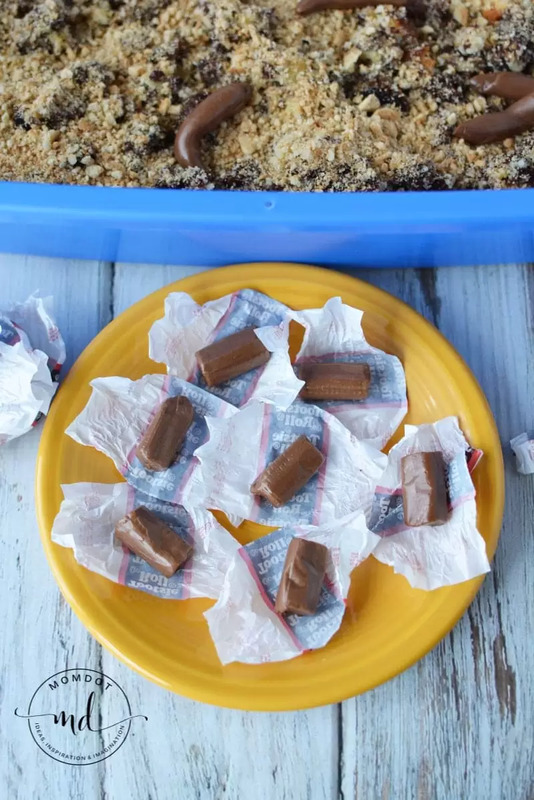 Open, unwrap but leave the wrappers under the candy, 7 tootsie rolls and place them onto a microwave safe plate. Microwave for 10 seconds and remove from oven. Shape and roll tootsie rolls into cat poop shape. Place on cake. Repeat until you have all tootsie rolls shaped and placed into pan.